It’s becoming harder to find a scapegoat for the market’s decline.Stocks have suffered four out of six losing sessions and three consecutive down days. There were no important economic data releases today. This market is falling due to its own exhaustion. It was not a good day for stocks, especially the Nasdaq-100 and Nasdaq Composite. It’s as simple as that. As a sidebar note, weakness in transportation stocks is causing sleepless nights for many portfolio managers as the index literally represents a driving force within the U.S. economy, delivering goods and people. Japan’s stronger than expected Core Machine Orders for October-2015 (+10.3% yr/yr vs. consensus @ 1.4% and +10.7% mth/mth vs. consensus @ -1.5%) boosted the Yen. Germany trade surplus balance surged to 20.8bn vs. consensus @ 20.0bn and prior @ 19.2bn and the EUR/USD exploded to the upside. The Canadian dollar advanced as crude oil prices closed @ 38.72, which is two dollars more than yesterday’s low @ 36.64. Demand for treasury notes and bonds is a reliable indicator of risk aversion. Panic induced buying of conservative fixed income has yet to emerge. Yellen’s forewarning to raise interest rates has plenty of street credibility. At best, bond prices are stabilizing while treasury rates are receding mildly. 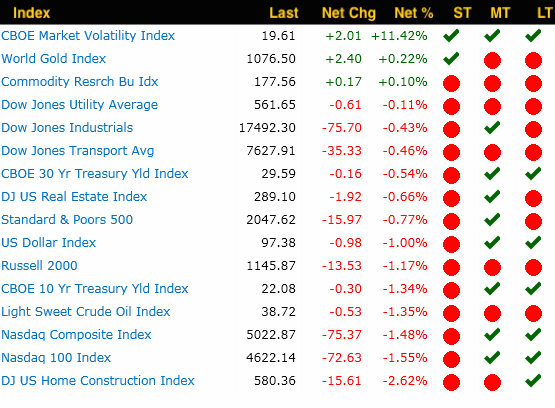 In Real Estate, the Home Construction Builders Index was the day’s worst performer in our capital markets summary, while VIX (volatility) topped the list with a gain of more than 11%. The SP-500 is undergoing death by a thousand cuts. A pattern of lower highs and lower lows during daily and intraday timeframes is not exactly a recipe for a bull market. The key support level at 2040 was temporarily violated today. Although bulls managed to stage some semblance of a rally during the final two hours of trading, today’s relative price strength performance of 25 belied weakness. Bearish momentum is accelerating and, with the exception of a few mega-cap technology companies, the heavier weighted market-cap components are either testing or surrendering their 50-day moving average. The bears are in control. EC I Just Got Another Raise - Thanks Ventas, Inc.